You’re getting traffic from Pinterest, now what?! Here is how to retain Pinterest viewers and turn them into fans! Last week I shared some tips on how to drive traffic to your site using Pinterest. Hopefully that post and podcast helped you either start to see traffic from Pinterest or to increase your traffic. Either way, I’m sure you have some traffic coming in from there. But, what do you do with that traffic? Pinterest viewers do not spent a lot of time on sites. Most of the time they find what they are looking for and leave within a matter of seconds. Your goal is to retain those readers and get them to your email list. In this weeks podcast I break down HOW to do that. You want traffic to your site and Pinterest is an excellent source for it, but if you don’t have a way to retain those viewers you are losing out on a bunch of opportunities. So, how do you retain all those new viewers or readers? Have them sign up for your email list! Why your email list? Because social media is fickle and every changing. Just think of the new Instagram feed that was rolled out this year, or the nightmare that is Facebook pages. If you share something on either social site, the likelihood of all of your fans seeing the post is very slim. They are missing out on the valuable information that you sharing over there. I’m not saying ditch all social media for email. I believe in what I call the Five Sigma Social. You want to strive to have 5 points of contacts with your readers. Those points of contact can be email, Pinterest, Instagram, Facebook and Twitter. Or any combination of social networks and email. The people that are the most connected to you are more likely to be raving fans and will help grow your business. You need to create and share content that people are actually looking for at the moment. When you can solve peoples wants or needs with your post you are more likely to gain a subscriber. Two tools that can help with that are the keyword hack and the content idea planner. You can use these tools to find out what people need and what time you should create it. Another great way is to just ask your readers what they are struggling with at the moment. You can write a whole post on the questions or create a FAQ section and direct readers there. This is a biggie for me. You HAVE to deliver on what you promise the reader in your pin description. If your pin description says you are going to help a reader in the kitchen with 7 easy hacks, then you better have 7 time saving ideas in your post! It builds trust between the reader and yourself when you deliver on what you promised. This can be done by delivering on your promises (see above), having an attractive website and providing valuable content. You want the reader to feel that they can come to you if they have a question. You want them to WANT to sign up for your email because they want to know or read more. You take a reader and turn them into a fan with trust. It may seem silly, but having an easy to navigate website is another way to build trust and ultimate retain a viewer. You want to have a picture of yourself somewhere on you site so that they can put a face to your writing. People ultimately want to be able to connect with other people, so help them out! You want to use bright images that stand out. I talked a little bit about how to create eye catching images in how to create the perfect pin. Beautiful images subconsciously tell the reader that you have a talent for photography or editing or design. It’s a way to build trust with your reader by showcasing your best work. A few other suggestions would be a search bar up top, social media icons and of course a visible email sign up. When I first started blogging over 6 years ago an opt-in was called a subscribe bribe. You were bribing the reader to subscribe to your email list. I think it’s a good concept but you want people to willingly sign up because they like your content or your writing style or your personality. Your opt-in (or subscribe bribe or content upgrade) should provide more value then what’s in your post. You can create an opt-in with Canva or PicMonkey and I have had success creating e-books with Microsoft word. 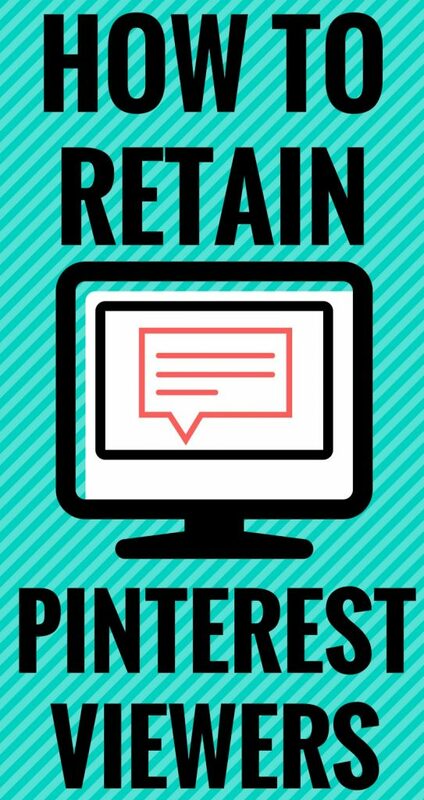 I have multiple opt-ins that I use to retain Pinterest subscribers. This past week I reading an email from Caressa Lenae and she said that you should ONE solid opt-in that attracts your ideal reader. It made me think and I may change my opt-in strategy soon. With most of the email providers listed above you can easily create a welcome series for your new subscribers. This is great time to get to know your readers and give them some insider information after your opt-in is delivered. I like to tell my subscribers how often they will hear from me. You want to email your subscribers consistently and NOT constantly. Once a week is the norm but as long as you let them know, you can email as often as you’d like. Think about your reader and what they have time to actually read. My good friend Kirsten from Create If Writing is an email expert. If you want to know more about email marketing check out her BLOG and her amazing E-BOOK: Email lists made easy for writers and bloggers. When you are writing your post you should think strategically about how to organically include your opt-in. Want access to a boat load of Pinterest resources? Sign up for access to the resource library and join the Pinning Partners community! This post contains affiliate links to products I highly recommend. Hey, thanks for the shout-outs! This is a great post. I love all your spot-on Pinterest advice! Thanks friend! I can’t mention email without dropping your name! Get important updates + social media guide. Success! Now check your email to confirm your subscription and snag your one page social media guide.